This is old version Minions Paradise 7.0.2787 apk for Android, you can install it if you want to downgrade or install old app. It is top Action apps from ELECTRONIC ARTS. Your job is to build everything needed by minions to live there. If there are some games of city or village builder that you ever played, you must love this game of minion. Like the other building game, you also have some jobs to turn the empty island into a good site. There are some activities that must be done by minions in order to build the island. Then, your job is to build the structure, activate the minions to produce some goods, make them working on several productions. You can assign the minions said the goods, collect the goods, and craft some complex items. You can get the progress of game by unlock the crafting structures. Some of crafting structures are to generate the coconut, bamboo planks, gas, razors, and many more. 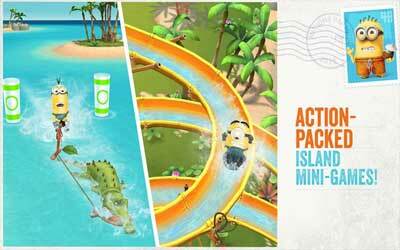 If you become more curious and exciting, you might install Minions Paradise for Android to play the game now. Hey paradise people! We made a few behind-the-scenes improvements to keep your island escape as fun as possible. Don’t forget to rate Minions Paradise to let us know how we’re doing.